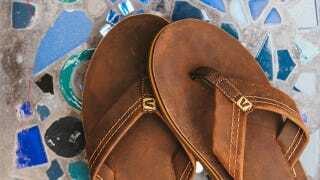 The oppressive heat and humidity of summer is in full swing across most of the country and an easy way to avoid exacerbating the swampy conditions is with a pair of flip flops. Get 25% off these understated classic flip-flops from Vere Sandals and grab a pair for just $24. Vere Sandals are handmade in Geneva, New York with a simple goal of eliminating waste during production. The straps are made of recyclable polyester and the outsoles are made from 100% recycled PLUSfoam. All Vere Sandals have a soft upper layer that molds to the shape of your foot, while the high-rebound middle layers provide extra spring and incredible durability. They also offer an anatomically correct arch for support, where many flip-flops provide none. Choose from the Louie ($32 now $24) which has a recycled polyester upper strap and embroidered logo. Or pick up the Al ($52 now $39) featuring a full-grain leather strap with subtle embossed logo. The Al has a lower profile footbed topped with the same full-grain leather with all the comfort and support layers below. And when you’ve run your flops into the ground from daily use, beach trips, park days, and festivals, Vere will send you a label to send back to them for recycling. Grab a pair now for just $24 and save 25%.